Education has changed dramatically since the Internet came into our living rooms. No longer do you need to enroll at the local college if you don't want to as there are a vast number of courses available online. This also has the advantage that you don't even need to travel to the college and it is a great time saver. The convenience and time saving is great, but to some extent it depends on individual learning styles, and at the end of the day you may actually prefer to learn in a traditional classroom with a tutor on hand to assist. No need to attend or travel to a college. Tutor support is usually available by email/phone or chat such as MSN Messenger. You can join in forums with other students/tutors for advice. A great deal of online courses these days provide qualifications and certificates. The price is comparable to college prices for courses, in some cases cheaper. There are a number of online learning sites to choose from; you have a comprehensive choice. Online learning environments are easy to use, and some sites provide training before you start your intended course. You do not have a face to face tutor; sometimes you don't even know what they look like. Remote working can be lonely. In some cases, email and questions are not answered in a short time period. You can't just go up to a fellow student to request help. Most online courses are easy to follow and step by step, but in some cases the meaning of the material is not always obvious, and further research may be necessary. Online learning does not provide you with all the equipment you require. You cannot learn effectively online without a computer, a good Internet connection and optionally a printer. College usually provides all these facilities with no further expense on your part. Reference material is not always available online. Colleges have their own libraries and library staff to assist in finding what you need. College is a great place to make new friends, online studying is remote and making friends is more difficult. Studying online takes more discipline than is the case with learning at a local college. You don't have any tutors or fellow students for support and to ensure you are completing your assignments on time. As you can see from these lists, it is a fairly balanced argument on both sides. A lot will depend on your lifestyle and time you wish to save. There is no doubt that learning online saves a lot of time and you have the convenience of learning at your own pace for the majority of courses. However, if you don't have much discipline, and let's face it we don't all then a college course is probably the best option. As for the types and variety of courses there are now hundreds to choose from. Some college and university institutions are now offering online courses full time or part time to go with attendance onsite. 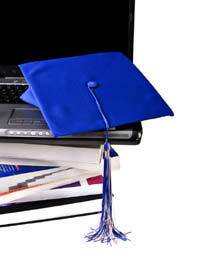 You can now study for a degree or masters degree completely online. However, these types of online courses are very expensive compared to traditional college/university courses. If you don't wish to apply to a specific institution to enroll on an online course, you can always enlist the assistance of a private tutor to assist remotely. There are a number of sites providing this facility and they can be extremely useful if you just wish to use them for additional support on an attended course. Private tutors can be reasonably priced or expensive, depending on the type of personal service you require. Here are some institutions providing online learning. Some of these have incorporated online learning into their normal website offerings, such as the BBC. These are just a few examples of what are available but there are plenty to choose from.